Oh, hi kids. I'm Greg Olson. Now, way back in the day I used to be backup catcher for the Atlanta Braves. Great job, best years of my life, wouldn't have traded it for the world. However, one day I got too cocky, kids. I took a risk, and wound up making a fool of myself. And I'm here, wounds mended, to tell you about it. You see, back in the 90's I was a quadder. Loved my ATV. Drove it in the winter, in the summer, at spring training. Anywhere I could, really. Aside from being a catcher, I loved ATVing. It was as much of a passion for me as catching fastballs from Greg Maddux. So one day, I'm driving my ATV around the field before warmups, and I get an idea. You see, I was never the best base-runner. I was slower than a tortoise on quaaludes, kids. And that's why I didn't get the starting gig, because Javy Lopez could run a little faster than me, you know, pre-steroids. So I thought 'what if I show Javy, and just take my ATV and instead of running the bases, I drive across in record time. Nobody'll say anything. Hell, nobody'll even notice. It'll go fine. However, kids, ol' Uncle Greg made a very massive oversights in that plan. For instance, he forgot how easy it is for an umpire to notice a medium-sized ATV rolling toward second base. But what really did me in...Chipper was up, and I was on first. I had the ATV ready to go and everything. I was just waiting for the hit. Sure enough, Chip hits it right toward Mickey Morandini at second. And I'm running toward Mickey. He's headed for the base, and so am I. So I hit the gas hard. I hit him head on, kids. Mickey Morandini damn near concussed thanks to my ATVing. I'm just paraphrasing there, I think. Long story short, Bobby threw me out of the game, and the umps put in a ban that ended up shortening my MLB career a bit. I was disgraced, and ashamed. And that's why I'm talking to you kids. Also, because they took away my ATV, and I need the money so I can get another one. But mostly the first thing. Yeah...talking to kids. 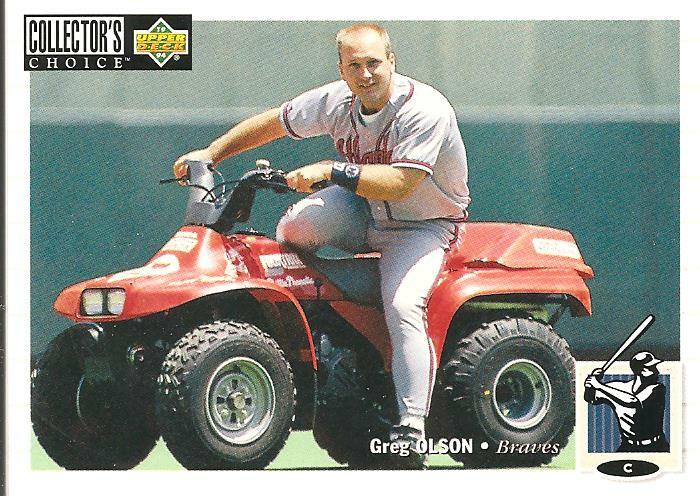 Teachin' em not to ride ATVs on the bases, because you might seriously injure a decent second baseman. Remember, kids. Stay in school, study hard...and keep your ATVs of the ball field. Well, as it's the season, I haven't been as consistent as I would have liked on the blog, as there's not a ton to blog about other than the last few remaining free agents nabbing teams and such. At least I have these old boxes to post the results of. 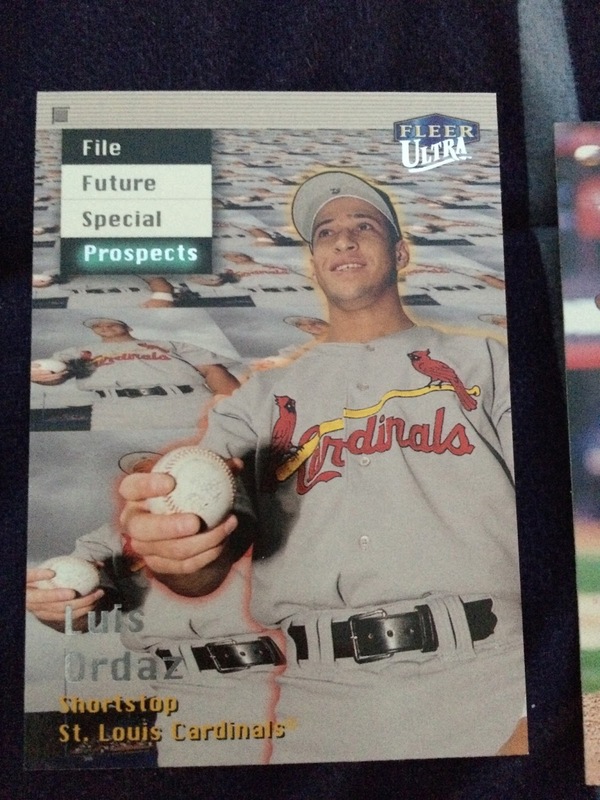 Today, we nab Part 2 of 3 of the box of Fleer Ultra 1999. Lots of fun, cool photography in this set, so we'll get back into the next 8 packs. Pack 9- Already you can see UD's poster boy, though surprisingly not Fleer's this year, from the rafters. Two great horizontals. Kevin Brown's is cropped a bit wide for me, like the photo's been chopped in half. 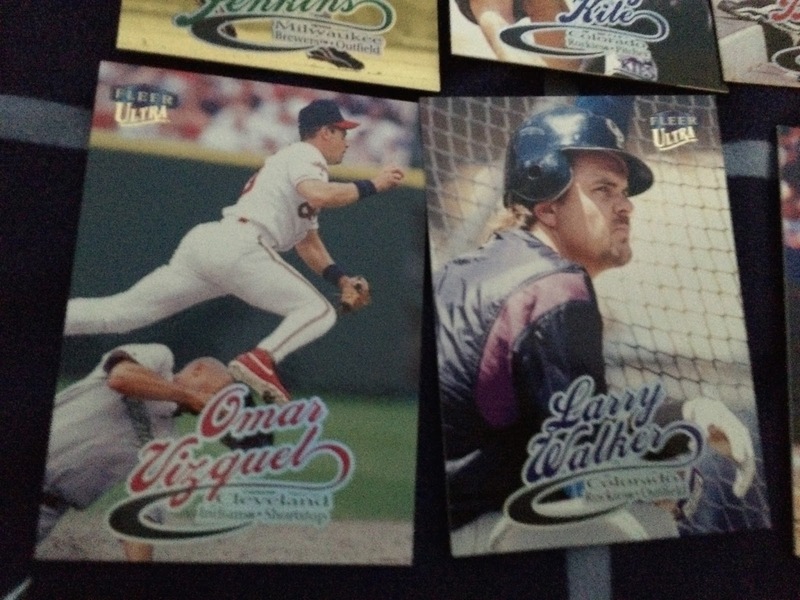 Boggs' is wonderful, as are most of his cards as a Tampa Bay Devil Ray. Of course, Greg Maddux is our highlight, for being ultra-cool and awesome. And for the photo being the exact right moment in the windup. Pack 10- Lots of very 90's people here. Juan-Gone and Grace were rounding out their tenures with their most notable teams. Gary Sheffield was juuust getting used to life in LA. Jamie Moyer was hitting 40, and also just becoming one of the best players in Seattle with his amazing age-defying pitching stuff. Johnny Damon was still mowing 'em down as a Royal. Pack 11- Very Met-heavy, this one. Charles Johnson landed in LA as one of the guys touted to replace Mike Piazza behind the plate. He didn't last long. One of my favorite photos in the set. Just Butch Huskey toweling off, looking really pissed. Double-Piazza Action. This was his first full season in Queens, and he quickly became one of the biggest stars in New York, and the case for his Cooperstown membership grew. 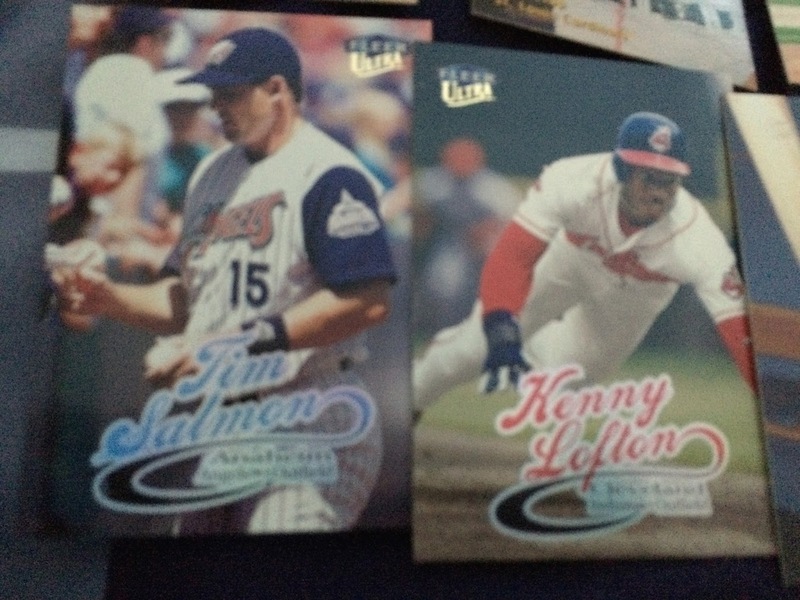 Two great hitters who will probably never make the Hall of Fame. Giambi had some strong seasons in Oakland, and El Grande Gato hit well wherever he played. Pack 12- Lots of little oddities in this one, guys in unfamiliar uniforms. RANDY JOHNSON AS AN ASTRO. Not something you see everyday. Meanwhile, Cal Ripken was still a standout in Baltimore in 1999. Hideo Nomo only played for the Mets briefly, but he's Hideo Nomo. He's pretty awesome. This Gold Medallion shot makes him look even awesomer. 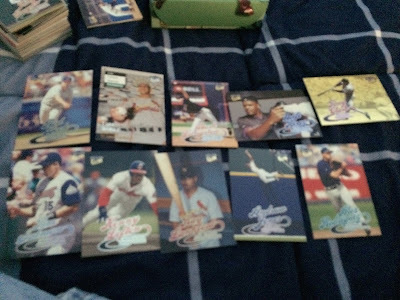 Pack 13- More than halfway through, and the box still has a lot of charm left. Robby Alomar's a landmark 2nd-baseman, and because of that I'll let it slide that he should have been pictured as a Cleveland Indian this card. Thankfully Jim Edmonds had one more year of being an Angel left before turning to the dark side. Pack 14- Lots going on here. Man, Fleer could really make a good product back in the day. Man, Ray Durham looks really excited. Not too many cards exist of Kenny Rogers as an Oakland A, but I love this one. He's wielding a bat and having fun, backwards-cap and all. Just so much character. 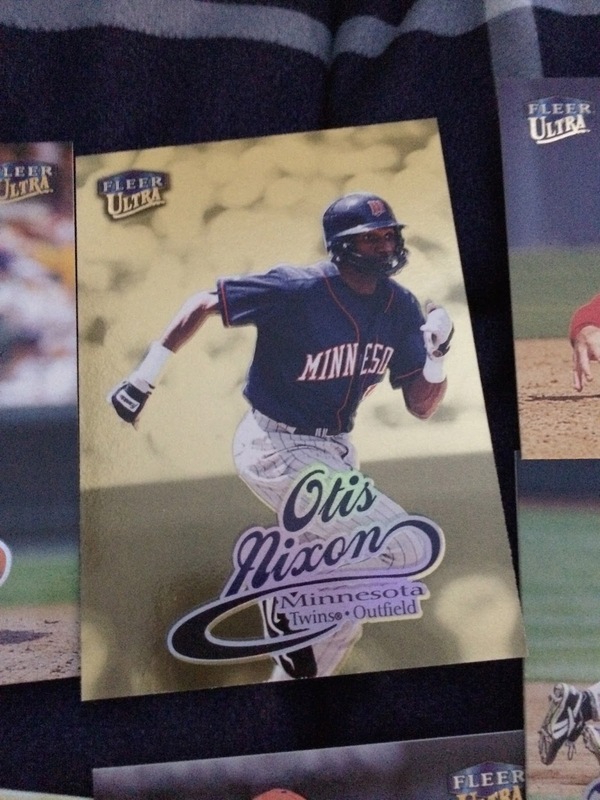 Here's our Gold Medallion of Miggy Tejada, as well as a cool reminder of how nice the 90's Angels uniforms were. Of course I'm showing Orel. He's one of those guys I just started collecting out of admiration. Plus, he's a Giant here. Very rare sight. Pack 15- Ton of fun stars in this one. First, here's some cool shots of pitchers. Darryl Kile, focused as hell, and Bartolo Colon taking a breather. How the heck is Barty still playing 17 years after this card? Two Borderline HOFers. Vizzy has more of a chance though, as he's one of the best defensive players of the 90's. Larry of course also has a case as a hitting machine. 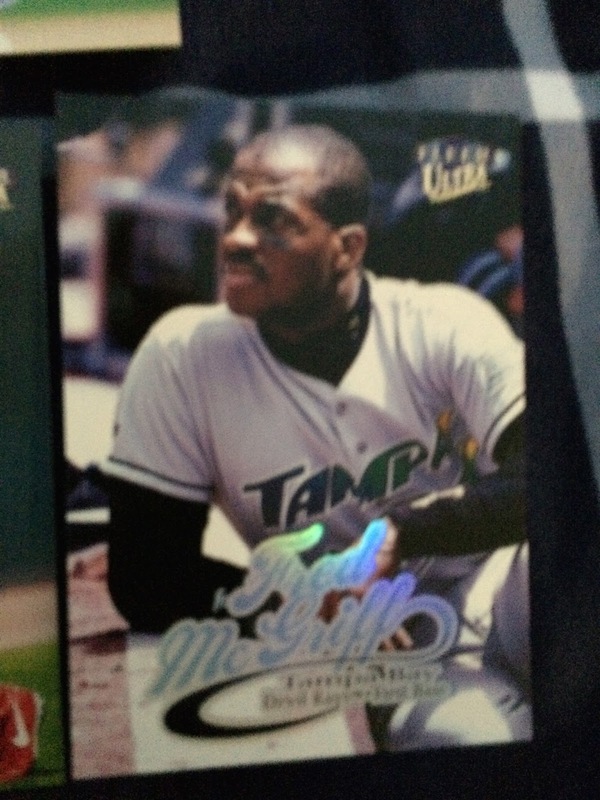 And of course, here's Fred McGriff. Because it wouldn't be Mint Condition without him. Pack 16- Some great photography and a pretty rare insert. I love this card. The hell is Dustin Hermanson laughing at?? Also, here's John Wettleland having a serious conversation with I-Rod. 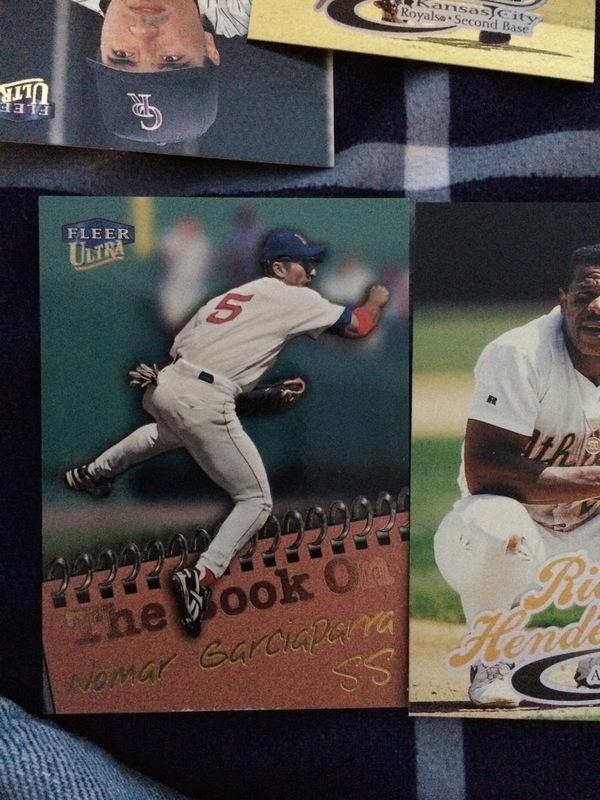 Our SUPER-AWESOME INSERT is a Thunderclap insert of NOMAR Garciaparra. 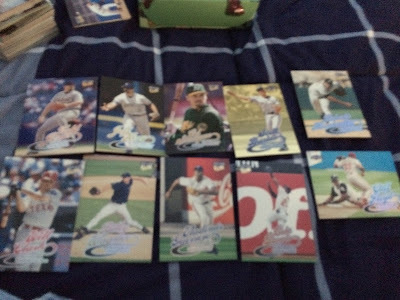 When I said he was all over card products in 1999, I was not kicking. Here's the UD poster boy, Ken Griffey Jr, making another outstanding catch in center. And here's the big rookie from 1998, Magglio Ordonez, looking cool. I'll post Part 3 sometime before Friday, because Friday I'll be going out of town. For something pretty big that has to do with something pretty obvious going on next weekend. 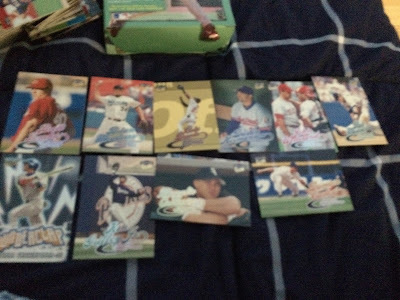 I feel like I've been showing too many Upper Deck boxes on the blog recently, out of the folder of boxes I've broken over the past year or so. 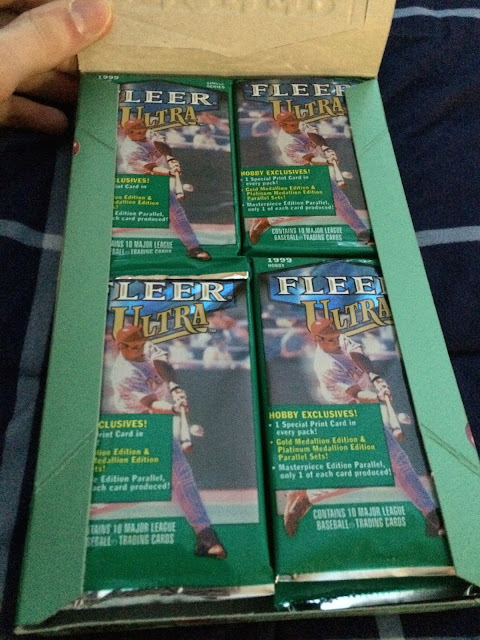 So why not throw a Fleer one into the fold? 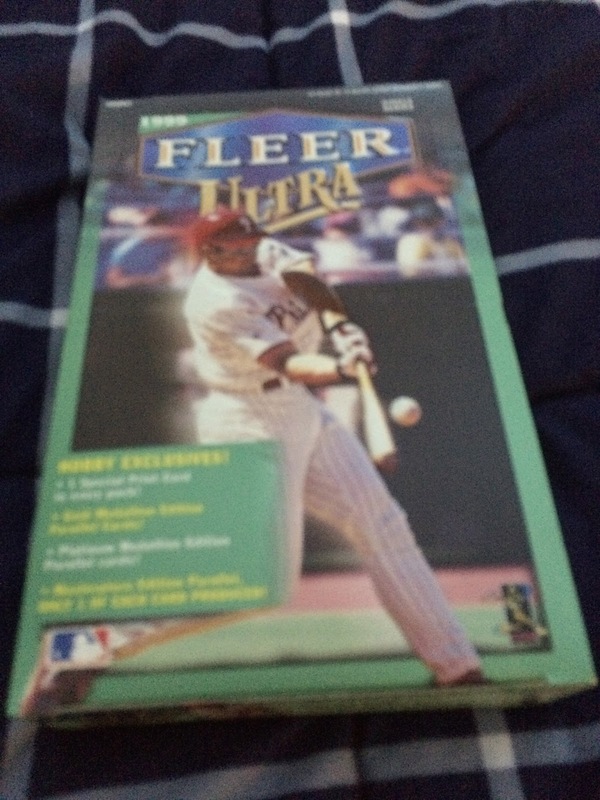 Especially one as awesome as a Fleer Ultra box from when the set was in its prime, from 1999. 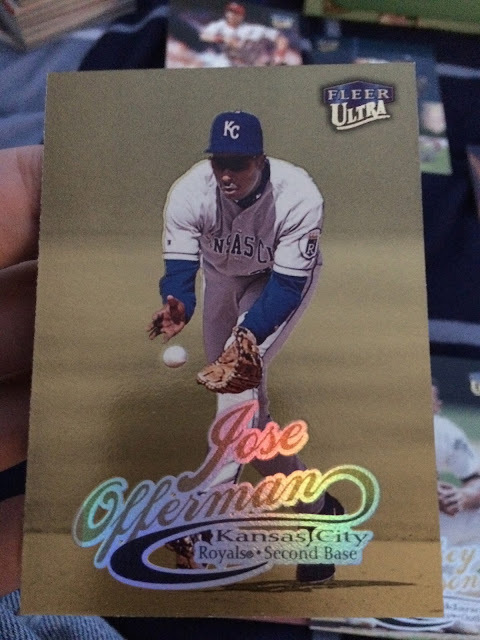 I've always had a soft spot for Ultra, as it was Fleer's answer to Stadium Club, but as it went on the 'design' became even more of an afterthought than with SC, with Ultra just using the same cursive-foil one as it went on, just with subtle changes, and periodical exceptions to the rule. The photography in Ultra was ridiculously fun, closer to Collector's Choice than Stadium Club, and just all-around cool at times. It's a shame that they were just-about closing up shop when I got into the hobby in 2007. Anyway, this box has 24 packs, 10 cards per pack. It'll probably take me three posts, depending on my mood at the end of 8 packs. Still, it's sure to be a fun rip. Pack 1- Already you can see how cool this set looks. Just a ton of character. This is your average base card, ft. Vinny Castilla. I like the little rainbow shine you get from the foil if you shoot it at a certain angle. Here are the backs. Full stats, a fun fact, another photo, and an easily readable card number. Gotta love Ultra. 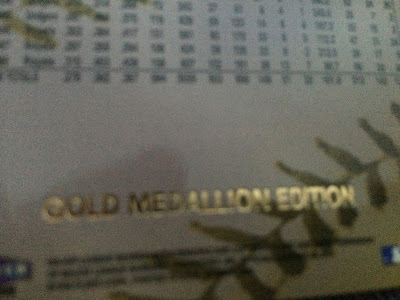 Also, each hobby pack comes with a GOLD MEDALLION PARALLEL. It's not numbered, but it's the same photo with a completely gold-toned background, which is really cool. Also, in case you couldn't tell, this is stamped on them all, on the back. Three guys who'll be on the same wall in Cooperstown in a couple years. The greatest base-stealer of all time, the greatest closer of all time, and one of the greatest hitters of all time. One of the more common inserts you can pull is 'The Book on', which is a little dossier on certain players. This one's of late-90's-superstar-and-SNL-fable Nomar Garciaparra. Pack 2- ABSOLUTELY NO DULL SHOTS HERE. NONE. These are what the Prospect cards look like. AND EVEN *THEY'RE* not dull. They're pretty cool-looking actually. 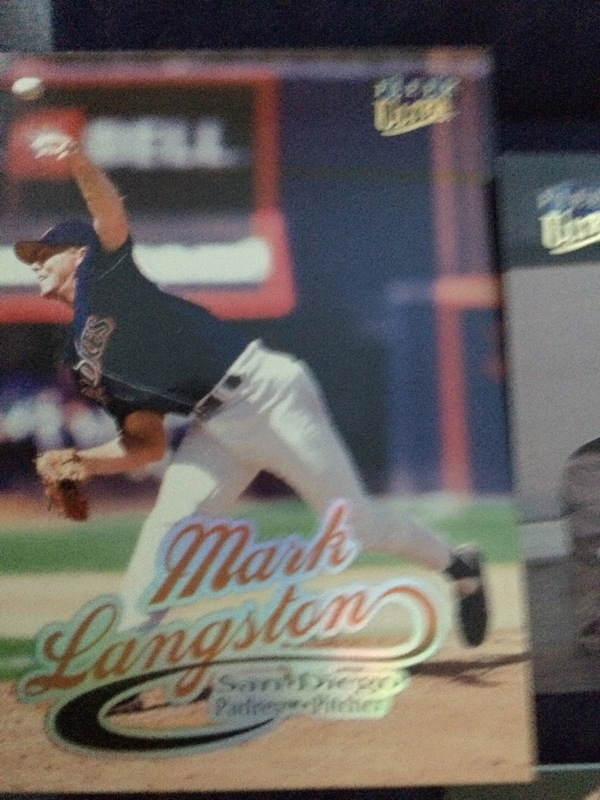 I had no clue Mark Langston pitched for the Padres. That's pretty cool. Here's Neifi Perez, lurking in the shadows with his camera. Our Gold Medallion is of Tony Clark. That just looks awesome with the gold tint. Two regional legends. Tim Salmon's gotta still be high on the leaderboards in Anaheim. They had to have adored him there. Meanwhile, Kenny Lofton's one of the best base-stealers in Cleveland history. Ray Lankford's wielding this bat like a lightsaber. 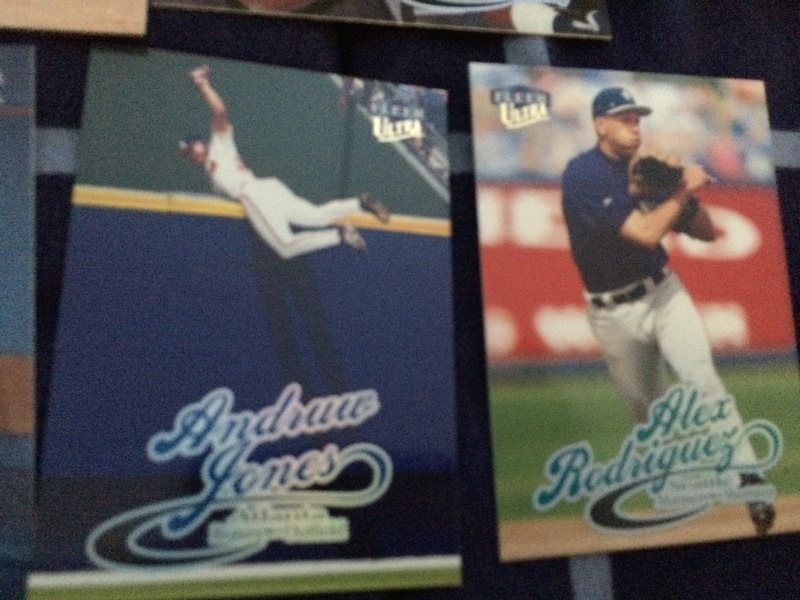 OH MY GOD THAT ANDRUW JONES CARD. Holy Crap. He takes up 20% of the card. It's zoomed back enough that it's capturing everything amazing about that play. Meanwhile, A-Rod's making a play in the field. Pack 3- This set could do a lot with zooming out too. Brosius is our Gold Medallion, and it improved the so-so photo. Two guys that are gonna rendezvous on the HOF ballot next year. Vlad has more of a chance for enshrinement though. Wagner was an awesome closer, don't get me wrong, but I'm not sure if he's Hall material. Meanwhile, here's Eric Davis making a nice catch, even well after his nice little round of relevance. 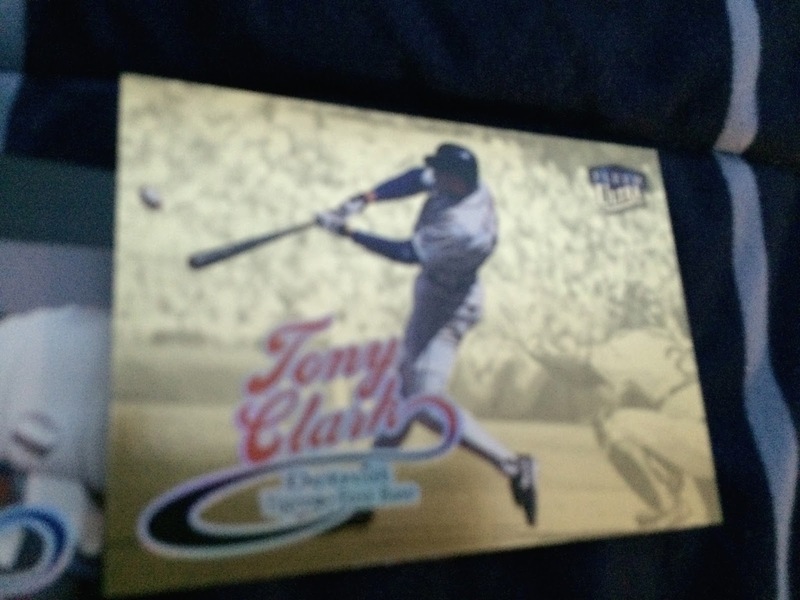 Pack 4- One of the only times in this box that the collation really takes away from the outcome. Carl Everett making a huge throw, right in front of a shot commemorating Kirk Gibson's famous '88 run. It's actually pretty symbolic. It's like he's trying to prevent the inevitable. Season Crowns, which is a subset, though it looks like an insert, documents things that happened during the 1998 season. 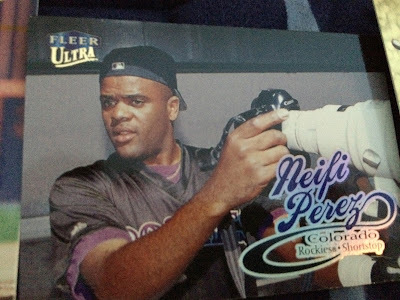 Hmmm...what did Sammy Sosa do during the 1998 season that was worthy of being documented on a subset card?? (Before you all comment about the home run race, I was being sarcastic). Here's a Cub that fans still celebrate at Wrigley, Kerry Wood, one of the stronger arms in Cubs history. He could notch wins AND close games. together at last...The Gold Medallion Scott Rolen, and the base Scott Rolen. And this was still during Rolen-mania. 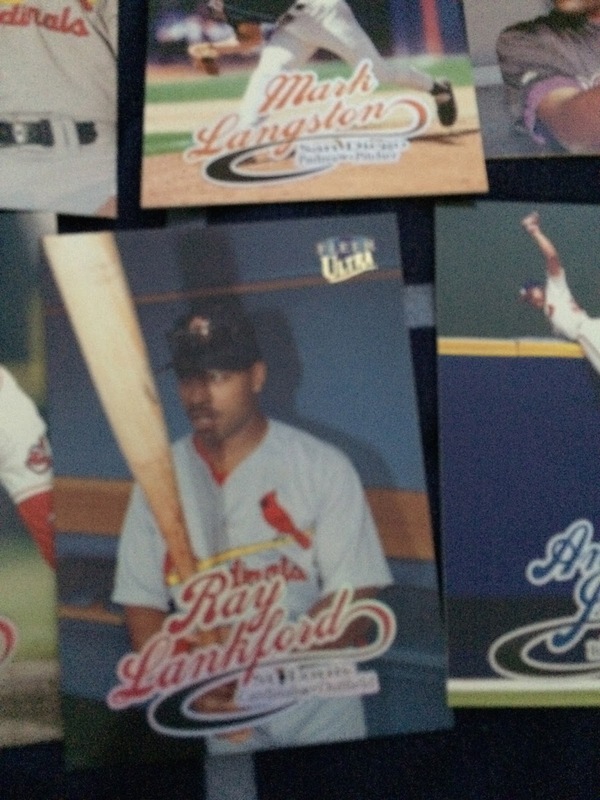 Here's a card of Barry Larkin, still pretty much in his prime, still playing some awesome baseball in Cincinnati. Pack 5- I will say that those Gold Medallions can really stand out. Two awesome horizontal shots. One of Dmitri Young going in for the swing, the other of Mike Lieberthal sliding and shrugging. Gold Medallion is of perennial Mariners catcher Dan Wilson. Moises Alou's just taking a break. He doesn't seemed too pleased about it, either. Two potential future-Hall-of-Famers. Ivan Rodriguez is looking pensive on the bench. Big Papi's looking attentive in the fi- WAIT, HE WAS IN THE FIELD? Wow, Big Papi playing defense is not something you see everyday. Our 'The Book on' insert is of PLEASE PLEASE EVENTUALLY IT BETTER HAPPEN Future Hall of Famer Jeff Bagwell. And also, Barry Bonds is there. Pack 6- A few more zoomed in shots here. Gold Medallion Denny Neagle signing some stuff. Also, here's a reminder that Devon White once played for the Diamondbacks, which is pretty cool. Jay Buhner's trying to remember where he parked. Also, here's a really cool double play shot from Miguel Tejada. Second appearance so far for Nomar Garciaparra, so you can tell how big a deal he was. Also present is Mark Grace, the guy who got his only World Series ring by leaving the team that still considers him a franchise legend. Way to go, Mark. 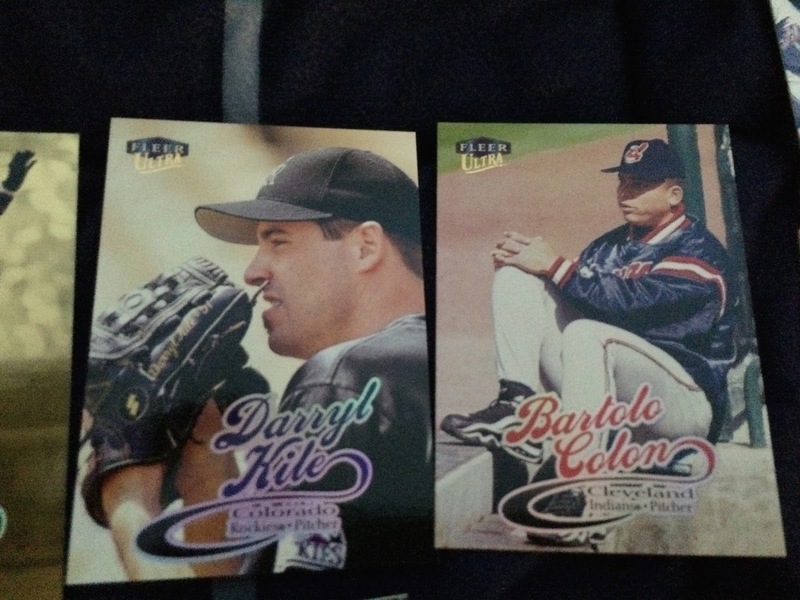 Also, here's a card of Minnesota pitching legend Brad Radke. 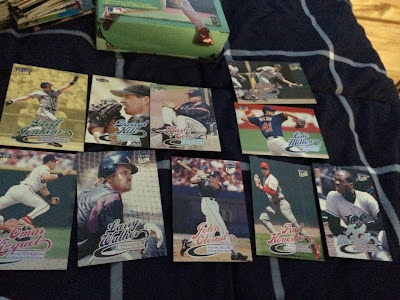 Pack 7- A ton of green in these cards, more than usual sets if you can believe that. Two cool horizontal shots. Kevin Young fielding a grounder, and Jeff Shaw stretching his legs. Jeff Conine, still on the Royals, working on a hit, and Derrek Lee celebrating his hit. 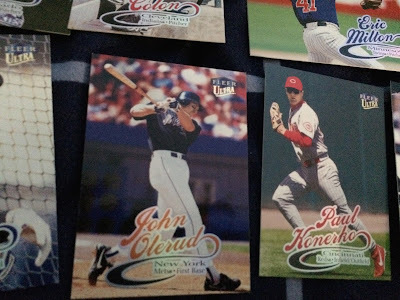 Beautiful card of Chan Ho Park, made even better by the gold medallion background. 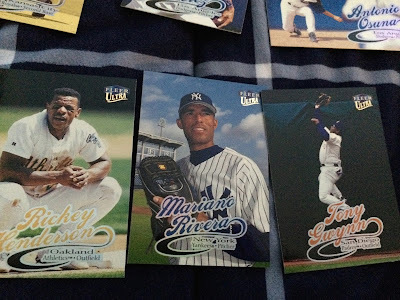 The checklists in this set were just extra cool photos of some of the top players. This is a nice little static shot of Kerry Wood. Pack 8, my last one for tonight- A few more similar shots, but still really cool. Remember how in the very late 90's Jose Canseco tried making a comeback with the Blue Jays and Rays? Three great horizontal shots. Brett Boone's working on a dropped ball. Chuck Knoblauch, now a Yankees trasure, slides back to first. Pedro Martinez signs some autographs for the fans. A very cool throwing shot from Karim Garcia. I have to draw attention to this one, not because it's a cool gold medallion shot, but he's wearing a modified football face mask. There have been modern interpretations of this same idea, but this batting helmet makes him look like he's about to tackle John Elway. It's quite amusing. Tomorrow, or sometime soon, I'll post the next third of the box. All very nice stuff ahead.